The mother of slain journalist James Foley said Wednesday the family was “delighted” to see the return of four Iranian-American citizens freed by Iran in a prisoner swap with the United States and is hopeful that the U.S. government will make hostages more of a priority. Foley, 40, went to Syria in 2012. He was captured that November and was beheaded by Islamic State militants in a video released in August 2014. Diane Foley, of Rochester, told The Associated Press on Wednesday the prisoner release gives her hope that what happened to her son and others in Syria won’t be repeated. “We Americans can do better, and God willing, we will … protect our citizens and help them when such a situation happens,” she said. The Islamic State group has acknowledged the death of the masked militant known as “Jihadi John,” who appeared in videos showing the beheadings of James Foley, U.S. journalist Steven Sotloff, U.S. aid worker Abdul-Rahman Kassig, British aid workers David Haines and Alan Henning, and Japanese journalist Kenji Goto. “ISIS is definitely a threat, and that’s why we need to be strong in terms of protecting our own and one another, and have coalitions for peace with our allies, as well as coalitions for war, that we need to be strong together against these threats,” Diane Foley said. Foley testified before a House subcommittee last year, demanding proof that U.S. policy not to negotiate with terrorists is saving American lives and decreasing the rate the U.S. citizens are being captured. She is working on a book about her son. She said the family was heading Wednesday to the Sundance Film Festival in Park City, Utah, where a documentary about Foley will make its debut. 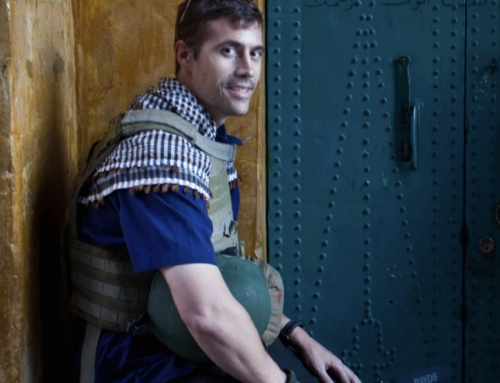 The film, titled, “Jim: The James Foley Story,” is by his childhood friend, Brian Oakes, and is scheduled to be shown on HBO next month. She said the family’s focus is to help protect journalists reporting from conflicts and continuing her son’s legacy. “He wanted to bring hope to kids in conflict zones in our inner cities, and that’s what we’re striving to do,” she said.